The two brothers are in 5th and 6th grade respectively. 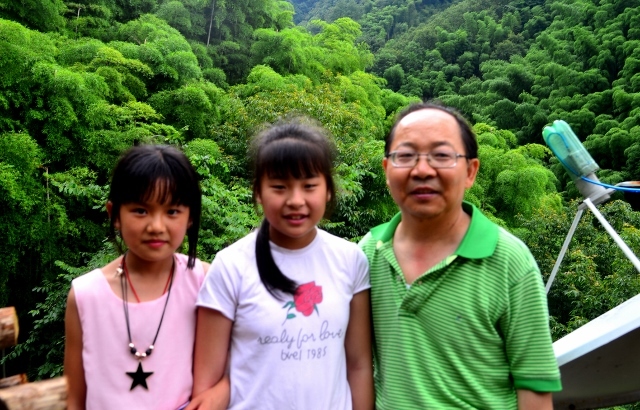 They have three older siblings, one in 12th grade and two in 9th grades (not twins) in their hometown in Gui Zhou Province. 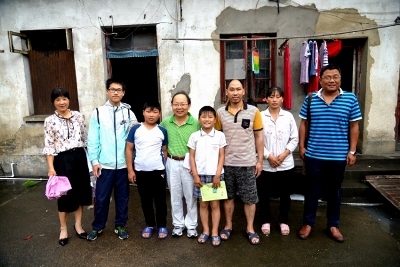 Their parents immigrated from rural area in Gui Zhou to Shanghai and then to Ningguo to seeking better life for their kids and themselves with hard labor work. They rent a two room rundown apartments to live to save money. The oldest sister not only takes care of her own extremely busy high school study but also take care of the 2nd and 3rd siblings in 9th grade. The family look happy and positive---really nice to see. This boy is a 5th grader living with her grandparents and his grandpa's deaf and dumb older brother. His parents were divorced and his father does odd jobs in Zheng Zhou (coming home once a year). He is excellent in school and likes badminton. Since the school is far away (common now in rural area), he and his grandma renta small room near school to stay there during school year ($130 a year). This girl is a first grader living with her grandgrand mother (sick in bed), grandparents, and her deaf and dumb parents (both). She is a very cute girl and was born almost deaf too. Noice the red `decoration' at her shouder? That was part of her cheaper version of `miracle' ear (the other part is surgically installed in her brain) to help her hear (needs battery). 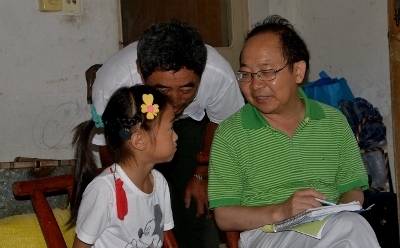 It costs the family over $30K (over 200K Yuan RMB) for the surgery and the equipment when she was 14 month old. She still needs to replace special battery (not cheap) to keep it working. She is excellent in school and at home. This girl is a 5th grader living with her grandparents. Her parents divorced and her father does odd jobs in Hai Ning, Zhe Jiang province and comes home only a couple of times a year. She and her grandma rent a small room near school (too far) for her study while her grandpa works in farm to help the family. She is outstanding in school with a lot of awards. She also likes drawing. 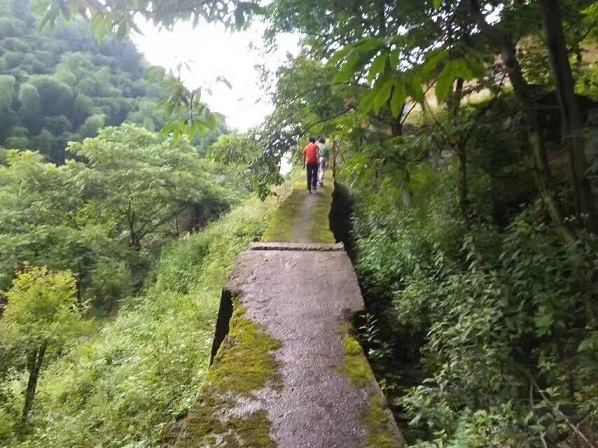 Her family house is at a very isolated area (walking to her house is an interesting experience---picture like but also a little dangerous during raining days like the day we visited her). She was sponsored by a student in UK (from Ninngguo). This girl (also in the above photo) is also a 5th grader living with her grandparents and her father. Her mother left when she was 4 and has been remarried. 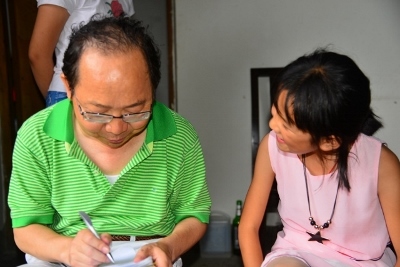 Her father does odd jobs at Ningguo City to support the family and has often headache. She and her grandma rent a small room near school (too far) during school year. I really like her smile. She likes English, drawing, and jump ropes. She is talented and has a very strong mind. We encourage her to tone down her temper a little when having conflict with her teacher and schoolmates. She and the other girl in the photo are very close friends and not far from each other. This boy is a 4th grader living with her grandparents and her father. Her parents were divorced. Her father does odd jobs in Ningguo City and was remarried with another young kid---not supporting the family. When talking about it, the boy tried very hard to keep himself from crying. Her grandpa had a stroke 12 years ago and still has some side effect. Her grandma and he rent a small room (too far) near school, and also helps a couple of other kids (to earn a little money). His aunt helps the family a little. The family is extremely poor. He likes Chinese and drawing.